John Flynn's Rolling Thunder is a difficult to track down movie on any format, it has never as far as I know been released on dvd in the UK or US. It is finally being released in the UK on dvd and blu ray in June. 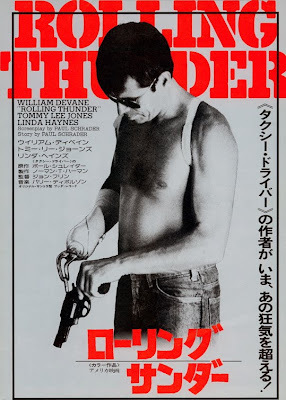 The 1977 movie, written by Paul Schrader, stars William Devane and a very youthful looking Tommy Lee Jones. I find it very difficult to understand how such a great movie has been hidden away throughout the dvd years, especially given the talent featured in front and behind the cameras. Major Charles Rane (Devane) and Sergeant Johnny Vohgel (Lee Jones) are welcomed back from service by Rane's home town. While away both were held captive as P.O.W's and suffered hellish tortures at the hands of their captors. Understandably both men are uncomfortable with the celebrity like reception they receive. Rane is given a new car and a box of silver dollars, one to represent every day he was held captive (and one for good luck), as a token of the towns gratitude. In the seven years he was away everything has changed, his son cannot recognise him and his wife has become engaged to another man. Rane is broken, dead inside and plagued by flashbacks to the horrific tortures he endured. Things get even worse for Rane as a gang of vicious thugs want the box of silver dollars, they beat and torture him to find out where the money is, being used to the treatment he refuses and loses a hand as a result. Rane's wife and son return during the robbery and all three members of the family are shot, with only the Major surviving. Rane has only one course of action left. 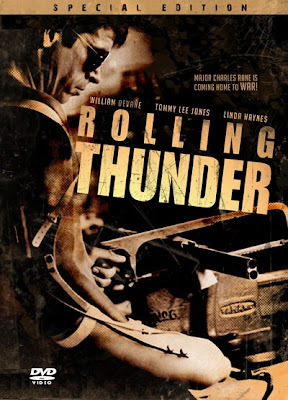 Rolling Thunder is an incredible movie that walks a tightrope between an art house style character study and a down and dirty 70's exploitation revenge flick, it works wonderfully well as either. The action comes mainly in the second half of the film, with the first half concentrating on the emotional void Rane has been transformed into. The scene where his wife tells him that she is engaged to another man is a perfect example, he sits impassively as his wife awaits an emotional eruption that never arrives. Devane acts so well in Rolling Thunder, taking less is more to the extreme he barely does anything, with a magnetic presence and thousand yard stare saying more than any amount of histrionics could. His chemistry with Tommy Lee Jones and Linda Haynes is superb. Tommy Lee Jones, who I couldn't imagine ever looking this young is also excellent in his role as Rane's friend who also cannot adjust to life back at home. The scene with his family, where Devane and Jones share a meal before doing what they have to do is one of the best scenes in the movie, where neither belong but go through the motions, once given the nod Jones comes alive again. Jones doesn't have much screen time but what he has he makes the most of and he handles himself very well during the shoot out at the end of the movie. Linda Haynes is great as a waitress who meets the major on his return, who thinks she can still see a glimmer of life left in Rane, she tries to coax it out of him but then realises it wasn't there to start with. When the action does arrive its set in a Mexican whorehouse, its extremely well shot, brutal and gory, with a real cathartic feeling. 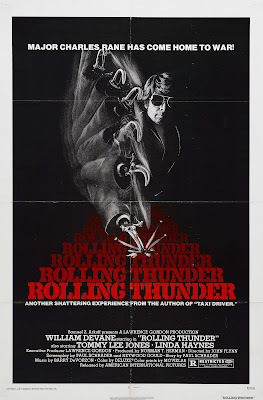 Like many other revenge movies before and since the movie creates conflicts of conscience in the viewer about right and wrong, Rolling Thunder unlike many of those other movies justifies you feeling good about the slaughter, even if only momentarily. A must see. 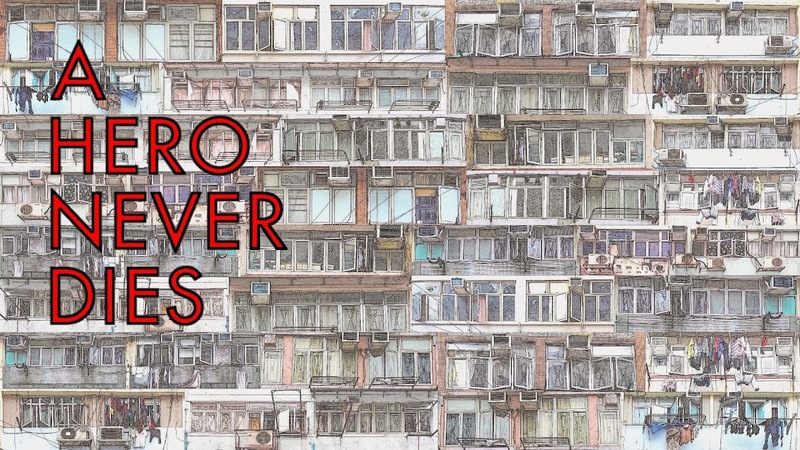 I love this movie, myself, hero. It's available here on DVD, but as part of MGM's On Demand DVD-R service. It's been a regular on cable the last few years. I reviewed it, too, a couple years ago. I have a DVD-R I made from the cable broadcast, but will definitely upgrade to this R2 disc when it becomes available. Great write up on a movie that, as you said, is criminally underrated. Thanks venoms5, can't wait to get my hands on the blu ray. Once it's more widely available it may get more recognition! Wes, I'll look up your review when I get a chance. I was kind of oblivious to the attention it received from QT until very recently. I know what you mean about the silver dollars being a little clunky but it doesn't bother me really. I enjoyed it so much it's the front runner for favourite of the year for me. What a great film! Devane at his best. Plus all the posters are awesome. I'd love to get a hold of any of those posters Ty, they are awesome!